When you think, "retro" you might be thinking of something old that is cool and making a comeback. When talking about retro food, you might get in your head things like Watergate Salad and Green Bean Casserole. When I think of retro foods, though, I think of the Wedge Salad. The dressing was cold and tangy, the bacon hot and crisp, and the lettuce crunchy. Delicious, and I didn't even like salad. Now, my husband and I like to make a wedge salad from time to time with a bit of an update, and so this is our version of a Wedge Salad. 4 oz bleu cheese, crumbled. Whisk together mayo, sour cream, worcestershire sauce, mustard, garlic powder, salt, pepper. Fold in the bleu cheese, gently. Store in the refrig until ready to use. Can be made ahead 24 hours in advance. Slice the lettuce in half, cutting across the middle, then each half into half. Serve by placing a wedge with the big side on the plate, with the layers of lettuce facing up. Pour 1/4 of the dressing over the lettuce. Sprinkle chopped bacon and chopped tomato across the salad. Serve. My husband does the same thing - he doesn't like blue cheese dressing so he get his wedge salad with ranch or thousand island. I'll take my wedge with any of the above salad dressing options! Yours looks delish! There is nothing like a good old wedge salad! We used to go to a steak place on special occasions when I was growing up and I always ordered the wedge salad with thousand island dressing as my starter. Thanks for the reminder, Terri! Good times! 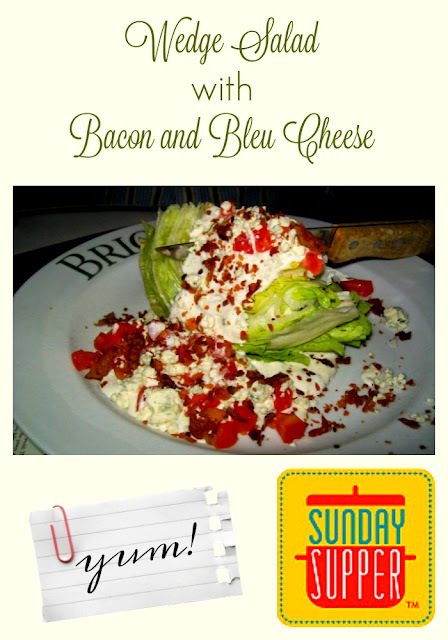 We love wedge salad! (And blue cheese!) I am glad this old recipe has made such a comeback! LOL, I find a lot of people don't like bleu cheese. I took me awhile to develop a taste for it. Thanks for stopping by! I wonder why it has fallen out of favor, because it is made with iceberg? It is really good! You are welcome! I love going down memory lane! A Classic......I still love a wedge salad every once in a while. I know your greens are supposed to be dark and iceberg is not considered a nutritional powerhouse but a wedge salad sure is delicious!! I LOVE wedge salad! So delicious! Ha this is how out of touch I am with the origin of dishes, when I saw these pop up on restaurant menus a few years ago I thought it was an odd new salad idea. Now I know it is actually a revamp of an old dish. Although I have to say yours looks better then the few salads I saw where they actually just served a wedge of iceburg and some bacon and a bottled blue cheese dressing. That is one great looking wedge salad!! I remember wedge salad and actually had a catering request for it! Thanks to you and your photo, I will be making this probably this weekend! I'm a huge dressing girl and I LOVE blue cheese and bacon! One of the prettiest salads I've seen! I love that you made the dressing from scratch! Yeah, I keep seeing that wedge salads are making a real comeback, and with good reason! Yours looks *really* good.